Flowable fill refers to a cementitious slurry consisting of a mixture of fine aggregate or filler, water, and cementitious material(s), which is used primarily as a backfill in lieu of compacted earth. This mixture is capable of filling all voids in irregular excavations and hard to reach places (such as under and around pipes), is self-leveling, and hardens in a matter of a few hours without the need for compaction in layers. Flowable fill is sometimes referred to as controlled density fill (CDF), controlled low strength material (CLSM), lean concrete slurry, and unshrinkable fill. Flowable fill is defined by the American Concrete Institute (ACI) as a self-compacting cementitious material that is in a flowable state at placement and has a compressive strength of 8.3 MPa (1,200 lb/in2) or less at 28 days. Most current applications for flowable fill involve unconfined compressive strengths of 2.1 MPa (300 lb/in3) or less. Flowable fill materials are primarily used in below grade applications such as utility trenches, where low strength and ease of placement are required. Flowable fill is typically placed using conventional ready-mix concrete trucks. 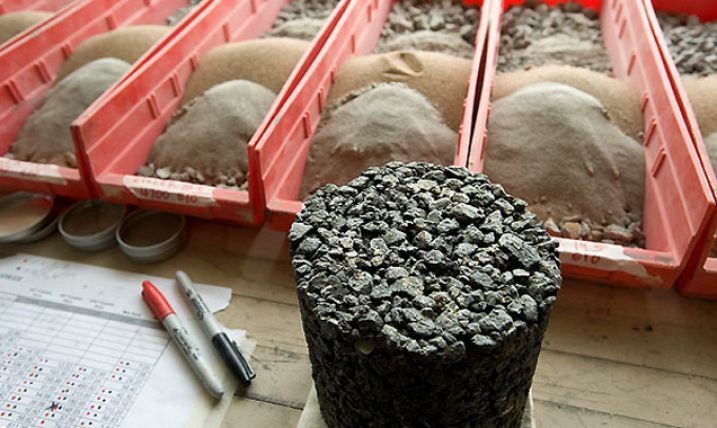 In many cases, these materials are designed so that they are comparable in strength to the surrounding soil after hardening, making excavation at a later time possible. Fine aggregates or fillers (usually sand) are often used in flowable fill mixtures that are produced at ready-mix plants, especially higher strength CLSM mixtures. Portland cement and/or supplementary cementitious materials and water are essential ingredients in all flowable fill mixtures, since it is the hydration of these cementitious materials that enables the flowable fill mixture to harden and develop strength. Fine aggregate or filler material provides the solids to develop compressive strength, as well as load-carrying capability. For purposes of this discussion, fine aggregates are materials with particles in a size range of 4.75 mm (No. 4 sieve) to 0.075 mm (No. 200 sieve), and filler refers to those materials with a size range of less than 0.075 mm (No. 200 sieve). The properties of fine aggregate or filler material that are most relevant to its use in flowable fill are its gradation and unit weight. The composite material must be sufficiently finely graded to enhance the flowability of the mix, but may also be granular enough to be able to drain some of the excess water from the mix prior to initial hardening. Sand is the most commonly used flowable fill material, although other materials (such as coal bottom ash, fly ash, spent foundry sand, quarry fines, and baghouse dust) have also been used. Depending on the unit weight of the flowable fill material, a cubic yard of flowable fill may contain between 680 and 1400 kg (1500 and 3000 pounds) of fine aggregate or filler material. Portland cements are hydraulic cements that set and harden by reacting with water, through hydration, to form a solidified mass. The amount of Portland cement in a flowable fill mix, together with the water and the quantity of Portland cement added, determines the ultimate strength of the mixture. At lower cement contents (in the 3 to 5 percent by weight range), the 28-day unconfined compressive strength of a flowable fill mixture is typically in the 0.5 to 1.0 MPa (75 to 150 lb/in2) range. Pozzolanic materials are materials composed of amorphous siliceous or siliceous and aluminous material in a finely divided (powdery) form (similar in size to Portland cement particles) that will, in the presence of water, react with an activator (typically calcium hydroxide and alkalis) to form compounds possessing cementitious properties. Descriptions of various kinds of pozzolans and their specifications are provided in ASTM C618. Self-cementing materials are materials that react with water to form hydration products without any activator. Coal fly ash is frequently used in flowable fill mixtures as a cementitious material and because its fine, spherical shaped particles greatly improve the fluidity or flowability of the mix. Fly ash generated during the combustion of bituminous coals exhibits pozzolanic properties and reacts with calcium oxide to form a cement paste. Fly ash generated during subbituminous coal combustion exhibits self-cementing properties and is sometimes used instead of Portland cement in areas where it is readily available. The amount of water in a flowable fill mix has a direct effect on the flowability and strength development of the mixture. Sufficient water must be added to lubricate the solids in the mixture in order to achieve the desired degree of flowability, which is frequently related to the slump of the mix. At a given cement content, an increase in the water content usually results in a slight decrease in the compressive strength development of the mix over time. Water requirements for mixture fluidity depend on the surface properties of the solids in the mixture. A range of 250 to 400 liters per cubic meter (50 to 80 gallons per cubic yard) will satisfy most material combinations. Proper size and grading are needed for a fine aggregate or filler material to effectively contribute to the flowability of a flowable fill mixture. 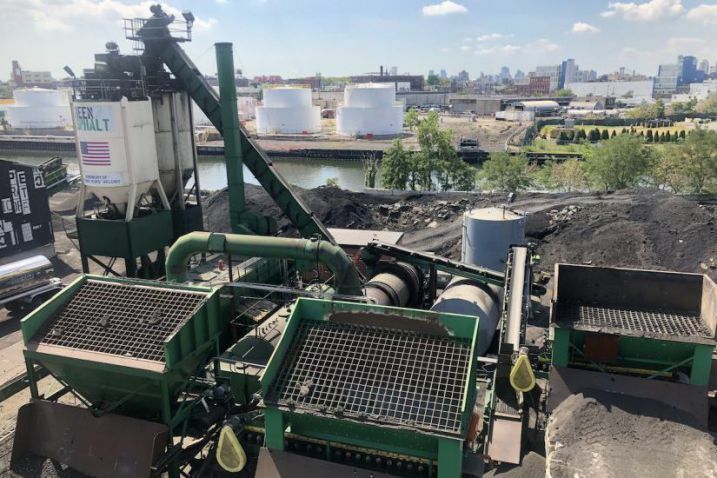 The most commonly used filled materials are sand and coal fly ash (pozzolanic), with the choice of material usually decided by availability and comparative cost. The unit weight or specific gravity of the fine aggregate or filler material determines to a great extent the unit weight or specific gravity of the resultant flowable fill. The following is a listing and brief comments on some of the more important properties of fine aggregate or filler material used in flowable fill mixtures. Gradation - the fine aggregate or filler particles must be finely graded to prevent a harsh mix (a stiff, low flow mix usually resulting from a preponderance of granular material) and have a sufficient range of finer size particles to provide flowability, stability, and minimal void spaces in the flowable fill mix. Unit Weight - the fine aggregate or filler materials should be within a relatively low to moderate range of unit weight in order to encourage flowability and discourage segregation of particles in the resultant flowable fill mix. Table 14 lists standard test methods used to evaluate fine aggregate or filler materials for use in flowable fill. Table 14. Fine aggregate or filler material test procedures. Fineness - the fineness of the cement or supplementary cementitious materials affects heat release and rate of hydration. Finer materials react faster, with a corresponding ncrease in early strength development. Fineness also influences workability, since the finer the material, the greater the surface area and frictional resistance of the plastic concrete. Table 15 provides a list of standard laboratory tests that are presently used to evaluate the mix design or expected performance of cementitious materials for use in flowable fill mixtures. Table 15. Cementitious materials test procedures. Table 16 lists standard test methods used to evaluate pozzolans, including coal fly ash, for its suitability in flowable fill applications. Table 16. Pozzolan test procedures. Flowable fill mixtures possess the characteristics of a high-quality compacted earth backfill after hardening, while resembling a very workable, lean concrete mix when produced, transported, and placed. The most important physical characteristics of flowable fill mixtures are its strength development, flowability, hardening time, bleeding and shrinkage, unit weight, bearing capacity, shear strength, and corrosion resistance. Strength Development - the most important property of flowable fill is its strength, measured as unconfined compressive strength. Strength development in flowable fill mixtures is directly related to the components of the mix. Flowability - flowability in the placement of flowable fill mixtures is primarily a function of the water content, although fly ash improves the flowability in the same way that fly ash makes concrete more pumpable. The higher the water content, the more flowable the mix. Flowability can be measured by one of several different methods, including slump and flow cone tests. The normal slump range for flowable fill mixtures is 150 to 250 mm (6 to 10 in). This range of slump corresponds to a flow time of 30 to 60 seconds through a standard flow cone. Hardening Time - the hardening time of flowable fill mixtures is directly related to the cement type, its content, the filler content (including fly ash), as well as the water content and weather conditions. Hardening of flowable fill mixes containing 5 percent cement (that is sufficient to support the weight of an average person) can usually be expected in about 1 to 4 hours. Within 24 hours, construction equipment is usually able to move across the surface of the flowable fill without any apparent damage. Bleeding and Shrinkage - some bleeding and shrinkage is possible in flowable fill mixes with relatively high water contents. Evaporation of bleed water from such mixes often results in a shrinkage of the flowable fill. The shrinkage may occur laterally as well as vertically, and may manifest itself as shrinkage cracks in the top surface of the material. No shrinkage or settlement is expected in flowable fill mixes once initial hardening has occurred. The main concern with shrinkage cracking is most likely to be the potential for water infiltration, freezing, and subsequent frost damage. Unit Weight - the density or unit weight of flowable fill mixtures is dependent primarily on the unit weight of the filler or aggregate material. The unit weight of mixtures with high sand filler content is normally in the range of 1900 to 2350 kg/m3 (115 to 145 lb/ft3). The unit weight of flowable fill mixtures in which fly ash is used as the filler material is normally in the range of 1500 to 1900 kg/m3 (90 to 115 lb/ft3). Where poor soil bearing conditions require the use of a lightweight fill material, low-density CLSM mixtures can be produced by the introduction of a preformed foaming agent, with higher dosages resulting in a greater reduction in mix density. The unit weight of low density CLSM mixtures can range from 320 to 1300 kg/m3 (20 to 80 lb/ft3), depending on the amount of preformed foam that is injected into the mixture during batching. Bearing Strength - the bearing strength of flowable fill mixtures is directly related to their unconfined compressive strength. A flowable fill mixture with a 28-day unconfined compressive strength of 1.0 MPa (150 lb/in2) has a bearing strength of approximately 9000 kg/m2 (10 tons/ft2). This is roughly three times greater than the bearing strength of a high quality, well-compacted granular borrow soil As the unconfined compressive strength of the mixture increases over time, so does the bearing strength. Shear Strength - triaxial shear strength testing of flowable fill mixes has shown internal friction angles ranging from 20 degrees for mixes using fine sand to 30 degrees for mixes using concrete sand. The cohesion of hardened flowable fill mixes has been found to be approximately 30 percent of the unconfined compressive strength. Corrosion Resistance - contact between flowable fill and metal pipes or concrete should be avoided so as not to promote corrosion of these materials. Corrosion is usually associated with acidity (low pH) and low electrical resistivity, although the solubility of constituents such as sulfates also affects corrosion. Flowable fill is ordinarily slightly alkaline and its resistivity increases as the material hardens and the cement continues to hydrate, so that within a few days, flowable fill usually has an electrical resistivity that is sufficient to alleviate most corrosivity concerns. A list of the standard test methods usually used to evaluate flowable fill materials is given in Table 17. Table 17. Flowable fill test procedures. American Concrete Institute. Controlled Low Strength Materials (CLSM). Report No. 229R-94, ACI Committee 229, Detroit, Michigan, July, 1994. Portland Cement Association. Cementitious Grouts and Grouting. Skokie, Illinois, 1990.